Progressive slots are one of the biggest draws to online casinos. 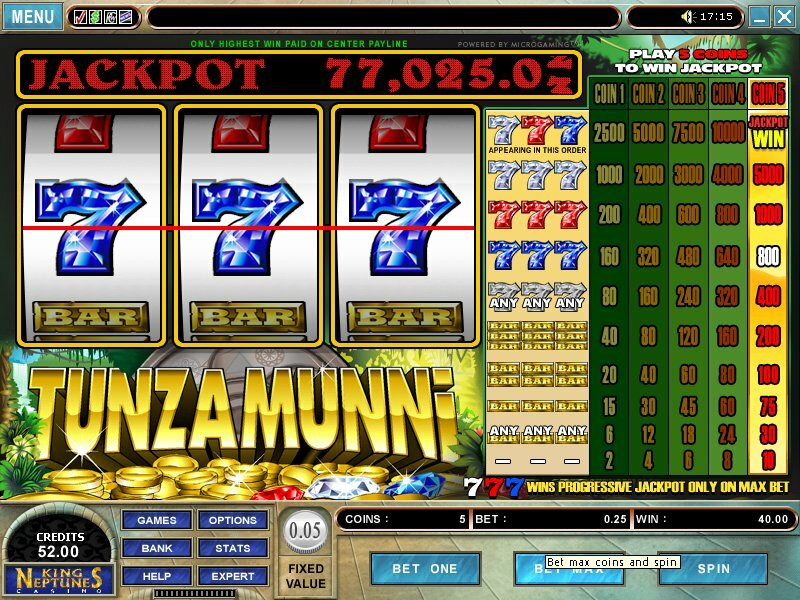 Nominal stakes can often result in humongous jackpots. Like their land-based counterparts, players from many different casinos pool their monies, but online progressive slots are not limited to a single region or chain of casinos. Thousands of players from around the world contribute a small amount with each spin, so the jackpots can climb quite rapidly. 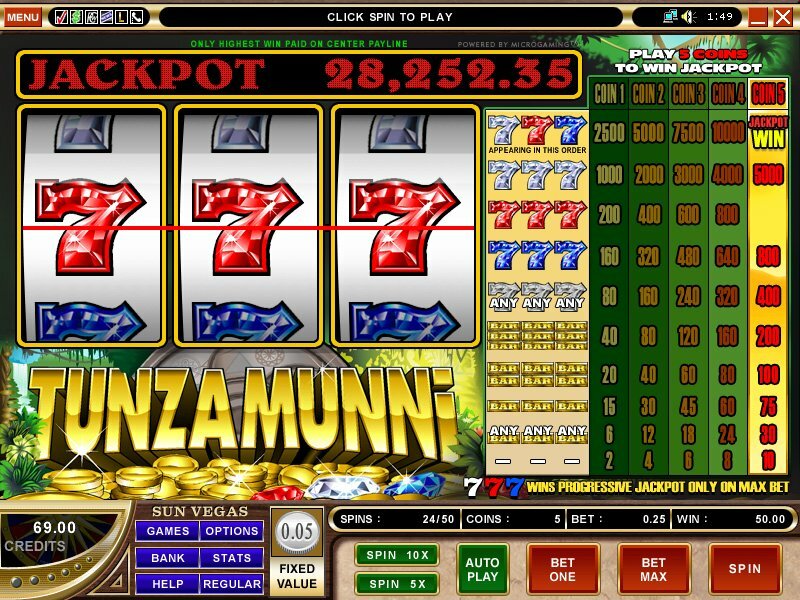 Microgaming features a large suite of progressive games, a couple of which are featured here. We don't have a lot of screen shots because honestly, we haven't won any jackpots! If you or someone you know has scored a big progressive win, and would like their story featured, please send it to us with a short summary at diceroll [at] fastodds.com, and we will post it. (please use large size images, if possible) Feel free to leave a comment at the bottom if you just have a story and would like to tell us about the win. This is one of microgaming's original progressive slots, dating back to around 2000. It's also a very old picture, as evidenced by the pre-Viper software. Not really a large win to boot, only 25 credits, but not bad considering the 0.75 credit bet. 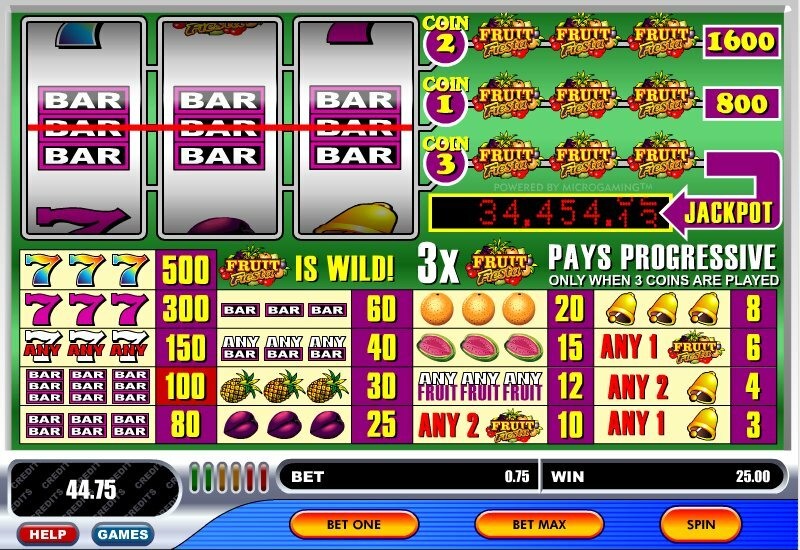 Fruit Fiesta is sort of a bargain player's progressive since the bet sizes are small and the jackpots can sometimes grow to be sizeable. Have a go! 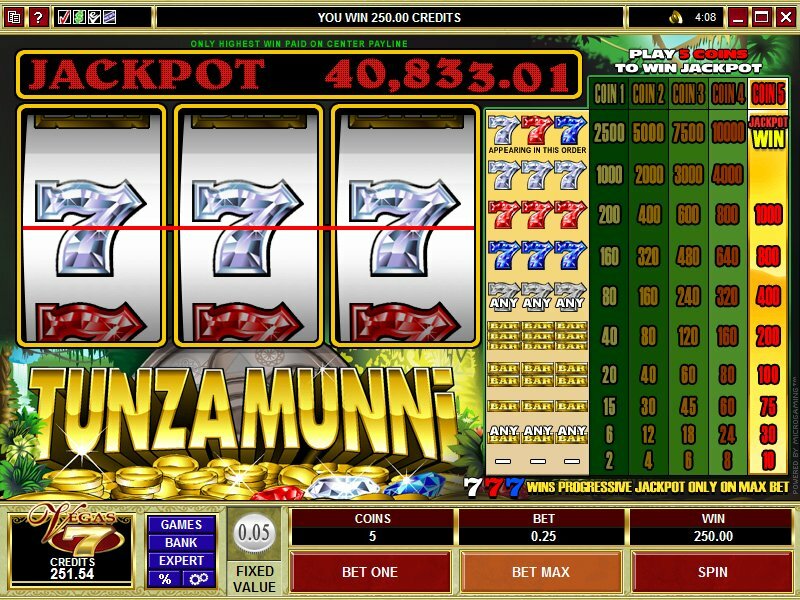 While generally fun and very cheap to play, Tunzamunni is a 3-reel, single payline progressive slot that can sometimes leave you hanging. If you're a high stakes player, you may grow bored with it - unless you're playing in expert mode and set auto-spin to 100. Over the years, I have logged thousands of spins on this slot, always trying to land the elusive progressive jackpot. If you've ever played Tunzamunni, you know that even three sevens of any color are quite rare and can take a few hundred (or more) spins to land. In this shot, three blue sevens on the payline resulted in an 800 coin win for 40 credits. Rarer yet, and one level up on the pay table, are the triple red sevens. I've scored these a number of times during my many hours playing Tunzamunni, but this is the only screenshot I have to prove it. Three red sevens yield a 1,000 coin payout for 50 credits. That's fairly decent considering the max bet size on this slot is only 0.25 credits... 200x the original bet. Alas, the holy grail of Tunzamunni! The only payout more rare than this is the silver-red-blue sevens which wins the progressive. Like I was saying, I have thousands - maybe even tens of thousands - of spins on this slot, and I have only seen the silver triple sevens one single time. If I didn't have this screenshot, their existence might still be in doubt. Three silver sevens on the payline rewards a hefty 5,000 coins for a 250 credit payout (1,000 times the original bet). What made this win all the more remarkable is that I was down to just 1.79 credits when I placed it. (Have a look at the credits meter). I was preparing to call it quits on the session, and instead of that sometimes sinking feeling from a losing session, I enjoyed a massive comeback and a payout that is very rare. Play progressive slots games at one of the internet's leading casino sites.